A few weeks ago I published a series of posts about different aspects of embedded objects in DOCX, XLSX and PPTX files and how to translate them a bit more conveniently. When I described this procedure to a colleague this afternoon, he thought it was a solution for convenient substitution of bitmap graphics in these files as well. Well, sort of, but not quite. 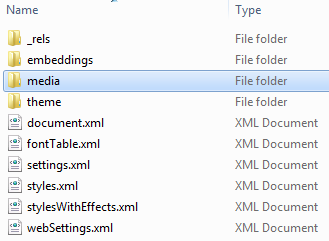 If you rename the extension of a DOCX file to ZIP and open the ZIP file using Windows Explorer (in order not to mess up the compression), you will see a folder named word. The view inside the media folder above shows one bitmap graphic (the JPEG file) and various other files with images of the embedded objects (an equation, and Excel table and a PowerPoint slide). Only the bitmap files are of real interest. If other graphic files localized for the target language are named the same as the original files in the media folder and substituted there, when the ZIP files is renamed to have its original extension, the substituted graphics will appear in the document the next time it is opened. This way, for example, screen shots for an entire file can be substituted quickly. One could, of course do this by a number of other means, but this way is fairly convenient and could probably be automated without much ado if your organization needs to make such substitutions a lot. Double-clicking the "broken" object display opened the object and restored the view. So clearly, refreshing object views involves updating the content of the media folder.